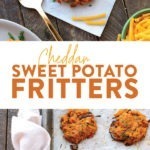 These Cheddar Sweet Potato Hash Browns Fritters are a fun twist off the traditional sweet potato latkes. Made with a base of grated sweet potatoes, sharp cheddar cheese and just the perfect blend of spices. These are delicious any time of day or night! Happy Monday my friends! It was another beautiful weekend here in Minnesota. This warm weather is sticking around and I’m not mad about it one bit. I am very excited to announce a new Fit Foodie Finds brand partnership with the NC Sweet Potato Commission. As you know, my childhood nickname from my dad was Spud. I was known to order a baked potato, hash browns, and sweet potato fries all in one sitting #sorrynotsorry. Really though, I love potatoes cooked all ways. More recently as I’ve aged into my mid to late twenties, I’ve been all about SWEET POTATOES. I’m sure you can see by FFF’s recipe collection that Team Fit Foodie is just a wee bit obsessed. Scroll down to see a few (ok, a bit more than a few) of our faves. 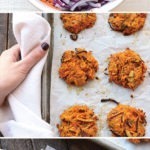 I love sweet potatoes for so many reasons beyond just flavor (cuz that rocks, too!). They’re versatile, good for you, and most importantly– available year round. Did I mention that they are reasonably priced, too? 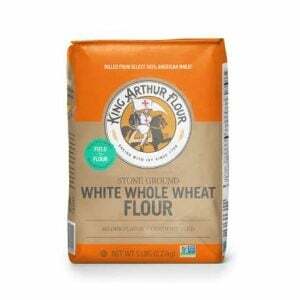 They’re a healthy (complex) carb packed with vitamins A, C, and manganese and I almost always include them in my weekly meal plan! North Carolina is the #1 sweet potato producing state (tempted to move there) and this is where the majority of the US’s sweet potato supply comes from. WOAH. Never been to North Carolina, but now it’s one of my favorite states. 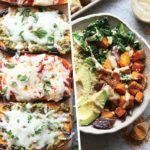 Today’s recipe is 1 word: EPIC.
. No, not to grate the cheese, but to grate the sweet potato itself! It’s really simple to do (see the video below), and this method is going to change your life. Just think of all the amazing sweet potato hash browns variations you’re going to make at home now that you know how to grate sweet potato! You know your sweet potato hash browns fritters are done when they begin to brown on the sides and top. Don’t forget to dress them up with some Greek yogurt and more chives. SO GOOD. First, preheat oven to 400ºF and line a baking sheet with parchment paper. Peel a large sweet potato and then use a cheese grater to grate sweet potato in order to form a hash. If you have multiple grate sizes on your grater, you’ll want to use the largest one. Place 3 cups of grated sweet potatoes plus all other ingredients into a large bowl and mix. Don’t be afraid to get messy and use your hands. Once everything is mixed. Use a 1/4 cup scoop to scoop mixture into palms. Press together, squeezing out as much air as possible to create a patty. Place patties on lined baking sheet and drizzle with olive oil. Season with salt and pepper, to taste. Bake at 400ºF for around 30 minutes or until the tops of the fritters have firmed up and begin to turn golden brown. Let full cool and store in the refrigerator in an air-tight container for up to 3-5 days. PS: we first came up with this recipe about 4 weeks ago and Lin and I have both made these twice ourselves because they are THAT GOOD. The post is sponsored by the NC Sweet Potato Commission. I was compensated and all opinions are my own. Thank you for making this blog possible and supporting my love for sweet potatoes.